Cirque du Soleil is an international circus known by many. I had a fantastic time watching them training as well as rehearsing before their opening night show at the Metro Radio Arena on Wednesday, what a fantastic opportunity it was. I must say how impressed I was to see so many different nationalities communicating as one (very) large family. Starting off as a circus traveling and performing in a tent, it is clear to say that they have defiantly come a long way, all due to the teams enthusiasm, commitment and of course, confidence. After meeting and speaking with Nicolas Chabot, a member who travels with the show and also has a great fountain of knowledge, it is fair to say the group deserve every bit of success they achieve. Together, the team is made up from a total of 100 people from 20 different countries around the world which include 50 artists, 25 technicians, 2 Olympians and more. With the youngest performer being 21 and the oldest being 46, most of the members are mainly aged between 23 and 28. It is great to see so many different cultures and talents come together to create such a breathtaking performance. Cirque du Soleil are so well known around the world due to their abilities and performances in countries such as Russia, Belgium, Poland, Germany, Canada… the list goes on. They are world famous which is absolutely amazing, not only for themselves, but for us to be able to experience the talent that they carry with them. On Sunday, they will pack up their essential gear in all 23 trucks that travel with them, including their own washing machines (because this is their life now) and head off to Glasgow. I thought life must be hard touring the world, only being off every Monday and only being able to go home for two weeks 4 times a year, however Cirque du Soleil seem to be over the moon with how far they have come, their achievements, the friends and also the family they have made traveling together, and of course, with the determination they had shown me backstage, I can only say they are looking forward to touring to the next country- Ireland. Life in the circus seems like a fun and courageous place to live, traveling the world and having the opportunity to see new sights instead of going home for those 2 weeks. This life seems full of excitement. Next on the list is Spain and now Brazil! Altogether, Cirque du Soleil have 19 different shows but are currently performing 2016 show ‘Ovo’ – a story about bugs in a community who learn that despite how different he may seem, the big, blue fly who comes along is in fact no different from the rest of the group after getting to know him. In the performance, videos of forests are projected across the stage which the team have actually made themselves and all props are curved to represent nature in the mot organic way possible. Movement in this show is essential for all times as they tell their story through the use of insects. In an interview, Tim Bennet said that, for him, the 1st show Cirque du Soleil ever did was his favourite due to the amazing experience. The show changed his idea of what a live performance can actually be. Backstage everyone was training and rehearsing so hard, it is definitely a big deal to the team to be the best they possibly can and to be able to deliver a show like no other. In the Slackwire training, I was amazed watching a member walk upside down on a wire back and forth, but when rode the unicycle across it, it was a whole new kind of feeling. I was totally zoned into watching. To me, it is such a unique talent to have. The aerial training by far had me on the edge of my seat. Performers were being flung almost off stage, spinning and flipping in midair before being caught by the ends of their legs at the other side. It certainly looked like they were flying. Rehearsing the piece again and again showed me complete dedication from the performers and that urge of wanting to do well. Finally, foot juggling training backstage with giant kiwis had all my attention. I think it’s such a creative piece in exploring ants and their food in a way of representing nature. The timing of the members as they juggled was totally synchronized and astonishing to watch. The accuracy created a rhythmic drumming sound, a treat for the ears. As well as this, the costumes were fantastic. Costumes has precise detail and looked fabulous, but the shoes caught my eye especially. Each one was finely painted but the best thing was the shape of the shoes. For each insect, they came in so many different shapes and sizes, some extremely large in fact. I have no idea how people manage to perform wearing such shoes that curve and curl around, but it is incredibly impressive. Cirque du Soleil just amaze me with everything they have to offer! 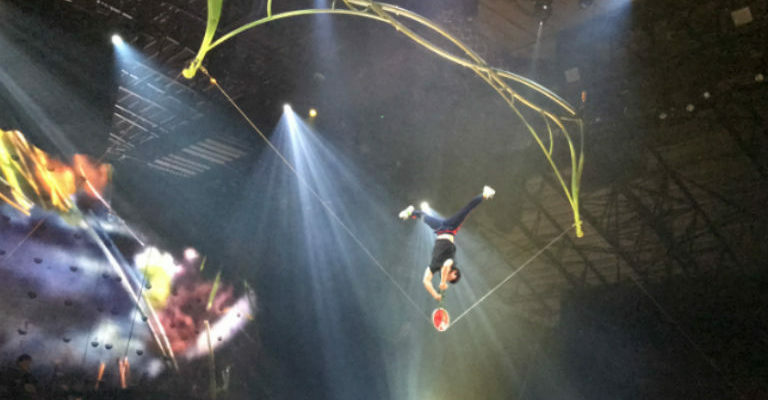 Altogether, with the closeness and friendliness of the members, this will definitely create a perfect show, not only exploring skills and talents of the circus, but also as a representation of the beauty of nature. If you have never seen Cirque du Soleil performing, you are missing out!